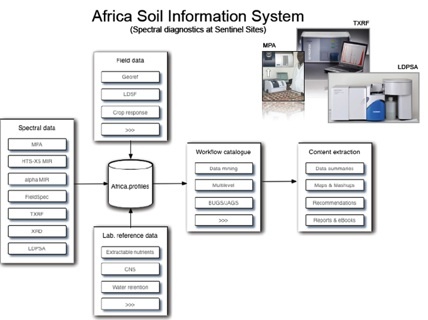 The Africa Soil Information Service (AfSIS) is developing continent-wide digital soil maps for sub-Saharan Africa using new types of soil analysis and statistical methods, and conducting agronomic field trials in selected sentinel sites. These efforts include the compilation and rescue of legacy soil profile data, new data collection and analysis, and system development for large-scale soil mapping using remote sensing imagery and crowdsourced ground observations. The project area includes ~17.5 million km2 of continental sub-Saharan Africa (SSA), an area that encompasses more than 90% of Africa’s human population living in 42 countries. The project area excludes hot and cold desert regions based on the recently revised Köppen-Geiger climate classification, as well as the non-desert areas of Northern Africa. AfSIS ground survey teams are in the process of surveying and sampling this area using a spatially stratified, random sampling approach consisting of 60, 100 km2 sentinel landscapes, which are statistically representative of the variability in climate, topography and vegetation of the project area. Twenty-one of the 60 sentinel landscapes fall within biodiversity hotspots as designated by Conservation International. New data collection uses a hierarchical sampling approach that replicates soil and other biophysical measurements at different spatial scales, linking consistent, georeferenced ground observations to laboratory measurements, agronomic field trials and remote sensing data. Ground surveys of the AfSIS sentinel landscapes will provide ~9,600 new soil profile observations consisting of more than 38,000 individual soil samples. Georeferencing and sentinel landscape documentation with digital photography will further ensure that sampling locations can be revisited at later points in time to quantify where specific changes occurred. AfSIS is also using both near and mid-infrared spectroscopy for soil analyses, allowing new samples to be analyzed more quickly and at a lower cost than by using conventional laboratory techniques alone. Spectral diagnostics are used to measure carbon and nutrient content, texture, mineralogy, water holding capacity, and an entire suite of other potentially important soil properties. New data collections are also supported with data from the most comprehensive international soil profile database for Africa (see ISRIC WISE v. 3.1 at www.isric.org) currently available, containing 4,173 African soil profiles. AfSIS is adding to this resource by digitizing additional soil profile “legacy data” where these can be retrieved from African soil survey and research organizations, georeferenced and subjected to ISRIC’s stringent data quality control criteria. This expanded soil profile database now contains more than 12,000 georeferenced profiles. Substantial effort is also to assembling and harmonizing satellite image time series and digital terrain models for SSA. These base maps are being used as spatial covariates for digital soil mapping, but can also be used for other mapping and modeling purposes. For example, AfSIS is using MODIS, Landsat, ASTER and Quickbird images and SRTM terrain models for soil mapping, land cover change detection and estimation of landscape carbon stocks. By linking legacy, field and laboratory data to remote sensing information, digital terrain models, and other existing environmental covariates, AfSIS is able to provide a unique resource for producing a new generation of Africa soil, vegetation and land-cover maps as well as wide range of statistical products.